It’s always a sad sight when you see a car go up in flames. It’s even more so when it’s a Corvette. In Cullman, Alabama, firefighters responded to a 911 call concerning a Corvette on fire at the intersection of Cleveland Avenue SW and Logan Street SW Tuesday afternoon. 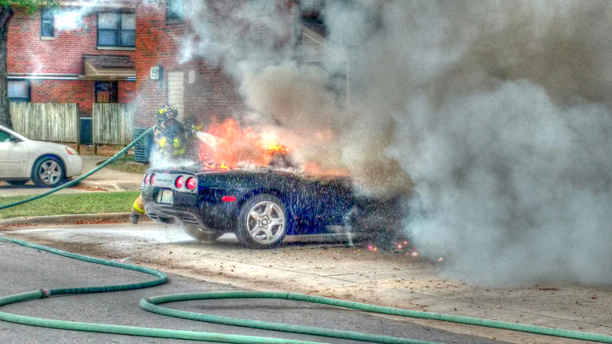 Upon arrival, the firefighters discovered a blue C5 Corvette convertible engulfed in flames (see image above). Because of the Corvettes sheet molded composite body, the fire was extremely aggressive and took emergency responders approximately 20 minutes to fully extinguish the fire. Once the fire was put out, the Corvette was deemed a ‘total loss’. Luckily, no one was injured in the fire including the firefighters and occupants of the Corvette, and the cause of the fire was not determined at the time of this writing. Even though the Corvette was a total loss, we’re glad to see nobody was injured!